A layer of cream cheese gives this French toast a little something extra. 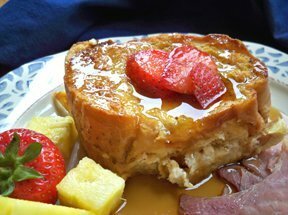 Preparing this overnight French toast the night before is a nice way to serve something special for your Mother's Day brunch without having to fuss first thing in the morning. Make mom feel extra special with this easy to make refreshing cocktail served at your Mother's Day Brunch. See how to make your muffins ahead of time and still be able to serve them warm and freshly baked.